Valentine Flower Cones are a fun and oh, so pretty way show your love to friends. And don’t our girlfriends deserve a little “Galentine” love on Valentine’s Day? Treat a few cherished friends to a sweet Valentine surprise! Today is Monday Morning Blooms! We are celebrating VALENTINE’S DAY! Make sure check out all the pretty ways to celebrate this love-ly day with flowers at the bottom of this post! Here are a few fun printables you can use to make the flower cones. Download them below. Get your choice of printable papers for flower cones HERE. Click on the image you want to use and then click on DOWNLOAD in the upper right-hand corner. Then they are ready to print! Easy-peasy! To make the paper cones, select and print out your fun cone paper. Cut the paper into an 8″ x 8″ square. Roll the paper into a cone with the paper on the diagonal. Use the bottom point as the point of the cone. If you have decorative scissors use them to cut the paper. Hot glue the seam shut. Tissue paper adds some pretty color and fluff to the arrangement. And it makes just a few flowers look full and pretty! Cut out colorful squares from the tissue. Pinch the center of the paper squares and give it a turn to make a little tissue paper puff ball. 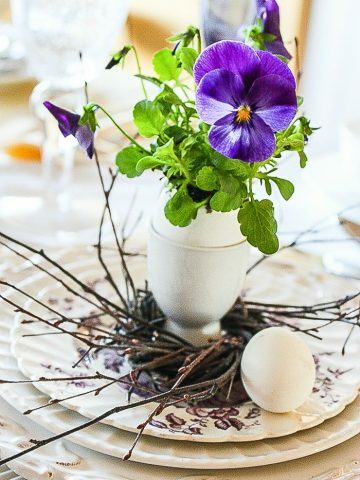 Keep the flowers fresh by cutting the stems at a 45% angle and sandwiching the stems between paper towels that have been soaked in a floral food solution. Remember to cut the flowers to the size of the cone. The paper towels holding the stems of the flowers are wrapped securely in plastic wrap. Slip the flowers into the cone and add the tissue paper puffs. Tie a ribbon around the cone and tie with a bow. Put a tiny dot of hot glue under the center of the bow to hold it in place. Or hot glue ribbon to either side of the cone and hang the cone to a door handle. Easy-peasy! Why not make a few and deliver them to the wonderful women in your life? 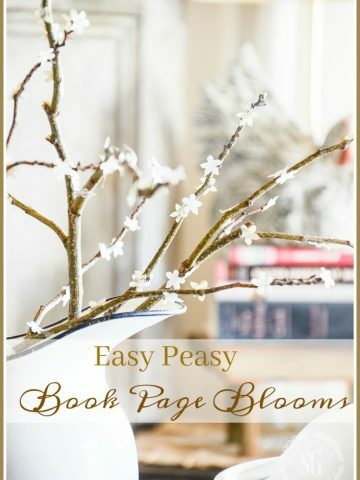 Please visit my Monday Morning Blooms friends and see how they are celebrating Valentine’s Day with flowers! Next month we are celebrating St. Patrick’s Day with flowers and a little luck of the Blarney! 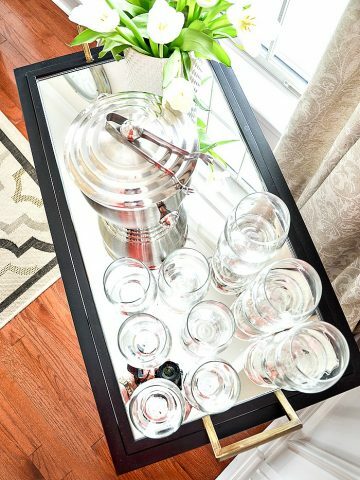 Yvonne, these are fun, quick, and inexpensive ideas! I might make them for my friends and add a small bottle of wine! Thanks for the ideas! Yvonne, your DIY and tutorial is just so beautiful! 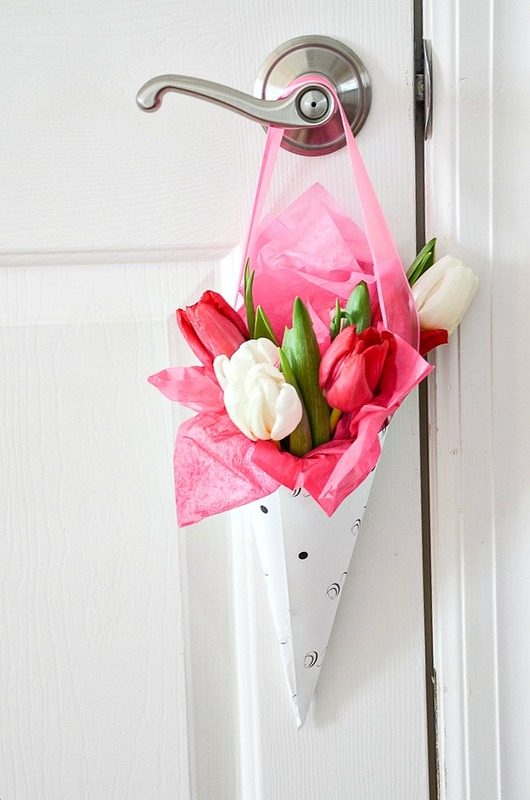 Anyone would be thrilled to get a cone of gorgeous tulips.with pretty paper and ribbon! It is a joy to share Monday Morning Blooms with you! Have fun with grand babies. What a pretty idea for a way to treat friends to a Valentine surprise! Thank you for your beautiful instructions and photos. Love the presentation! Tissue bunches are genius. Thanks for sharing this one. ? Yvonne What a wonderful idea! I love it & pinned it to my Valentine’s board. Thank you! Clara ❤️?? I am a wedding officiant. I have a small wedding coming up end of February and I will include a small bridal bouquet in the bride’s package. This lovely flower cone will be perfect for the occasion. So glad you published it today, just when I was thinking about that wedding. I really enjoy your blog and your site is truly inspirational and beautiful So happy I found it. Hi Monique, Oh, how pretty for a wedding! Hi Yvonne…this is the sweetest idea! Thank you for sharing your wonderful tutorial! I am picturing making smaller versions too and hanging them from my little white feather tree! Many thanks! Wonderful post. Pinning to make for next year. This year I stitched 16 beaded and embroidered felt hearts for my friends. Your project will take way less time and still make my girlfriends feel special! Such a cute sweet idea Yvonne, who wouldn’t love to receive such a delightful bouquet! Great tutorial, too, just adorable! Thanks, Jenny! Isn’t it fun? Mary, what a compliment coming from you! I love being a part of Monday Morning Blooms. Yvonne, I so remember many years ago being so mesmerized by your creativeness…learning how simple DIY’s can be larger than life beautiful…this one is no exception…love the beautiful cones of Valentine’s Day flowers and I can see this being used in other holidays too..like May Day..and what a treat for guests to have too! 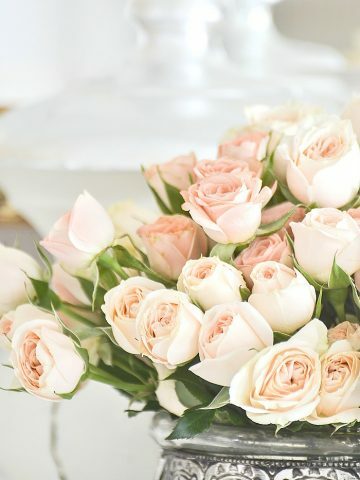 When I go flower shopping I take a bucket of water and fill it with paper towels and water…a trick I learned from the Whole Foods florist and I see that you use that too!!! It is a wonderful pleasure to participate in the first Monday of the Month with you…Miss you lots!!! Have a great week Yvonne and regards to your sweet Valentine, Bobby! Thanks, Shirley! Tell Tommy Bobby is ready for a game of golf! Are you going to Haven? Haven…it depends on when it is…we have a very full summer schedule…he can come and golf here right outside our backyard!